Make your big day memorable by capturing pictures of you and your loved ones using this fun Photo Booth Prop Kit. 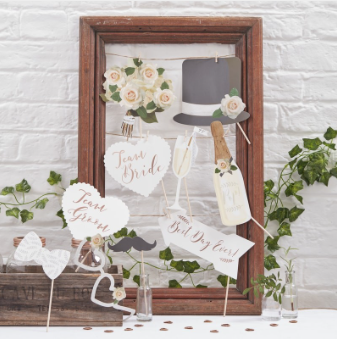 Create your own Photo Booth fun by posing with these lovely novelty props. 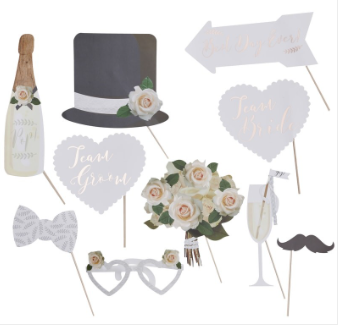 Each Photo Booth pack contains: 1x Champagne Bottle, 1x Top Hat, 1x Team Groom Sign, x Team Bride Sign, 1x Heart Glasses, 1x Bouquet, 1x Champagne Flute, 1x Moustache, 1x Bow Tie and 1x Best Day Ever Sign. Each prop comes complete with wooden sticks. Each pack contains 10 props measuring: 20cm (W) x 25cm (H). Each prop varies in size.